"THE DREAMER THE THINKER AND THE PHILOSOPHER: A CONVERSATION WITH THE THINKER"
"The Dreamer, The Writer & The Philosopher: a conversation with The Thinker" was a commissioned performance by Labbodies for The Baltimore Museum of Art's 100th year anniversary gala The Party of the Century. The works curated by Labbodies were part of Fast Forward Future and reimagined what the museum or the museum experience might look like 100 years from today. For this happening I envisioned a time when the human self would pluralize with many simultaneous extensions/manifestations of the self. For this performance I had the opportunity to extend myself and work with the writer Waqia Abdul-Kareem and the dreamer/poet Jacob Budenz in the realization of "The Dreamer, The Writer & The Philosopher: a conversation with The Thinker". The Baltimore Museum of Art's "The Thinker" was removed before the 100th year celebration to accommodate more guests. The Philosopher was first seen outside on The Grand Merrick Entrance and was last seen in the museum Atrium. The Dreamer stood, sat and twirled around in The Antioch Court for 3 hours. 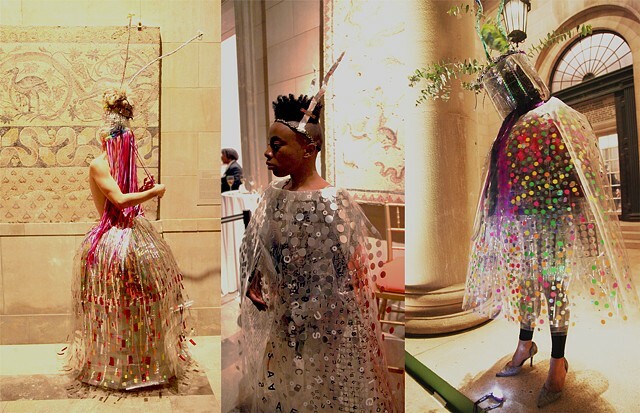 He wore a colorful tall headdress, covering his entire face and chest, along with a futuristic spherical plastic dress while The Writer wore beautiful silver horns and a mesmerizing plastic garment with silver circles, letters and other accents. She strolled through The Antioch and Fox Courts for the length of the evening, quietly observing and taking notes in a feather pad with a feather pen.